The recent Federal Court decision recognizing Métis and non-status Indians as Indians under the Constitution Act is just the latest in a long line of landmark court cases that have helped define and shape aboriginal rights in Canada. CBC News examines six key decisions. Tuesday's Federal Court decision recognizing Métis and non-status Indians as Indians under Section 91(24) of the Constitution Act is just one of several landmark court decisions over the years that have helped define and shape aboriginal rights in Canada. Below is a selection of some key court rulings. Calder et al. v. B.C. attorney general (1973) — The split Supreme Court of Canada decision in this case opened the door to negotiations between the government and First Nations to establish rights to land and resources and launched the land claims process that continues to this day. B.C. cabinet minister and Nisga'a chief Frank Arthur Calder, the first status Indian to be elected to a Canadian legislature, and the Nisga'a tribal council took the B.C. government to court, arguing that the aboriginal title to about 2,600 square kilometres of Nisga'a land in and around the Nass River Valley in northwestern B.C. had never been extinguished. Although the court ultimately ruled against the Nisga'a, the decision was the first time the courts acknowledged that aboriginal title to land existed prior to colonization and the Royal Proclamation of 1763. The judges could not agree, however, on whether that title extended to the modern day, with three of them saying it did and three arguing the title was extinguished when the laws of the B.C. colonial government took effect. A seventh judge ruled against the Nisga'a on a technicality, but the case laid the groundwork for the adoption of the groundbreaking Nisga'a Treaty in 2000, the first contemporary land claims agreement in B.C., and other land agreements. R. v. Sparrow (1990) — This case is considered the first Supreme Court test of the scope of Section 35(1) of the Constitution Act, 1982, which recognizes and affirms the "existing aboriginal and treaty rights" of the aboriginal people of Canada and has been at the centre of many court battles over land and resource rights. In its decision, the court for the first time set out criteria for determining whether a right can be considered to be an "existing" right and whether the government is justified in curtailing such a right. The case stems from the 1984 arrest of Ronald Edward Sparrow, a member of the Musqueam band in B.C., who was charged with violating fisheries regulations when he used a net that was longer than his fishing licence allowed. Sparrow argued that his right to fish with the net was an existing aboriginal right protected by Sec. 35 (1) of the Constitution Act. The court agreed but stipulated that the right is not absolute and can be, in certain circumstances, infringed upon. Delgamuukw v. British Columbia (1997) — Although the Supreme Court of Canada never ruled on the question at the heart of this case, the statements it made about aboriginal land title were precedent setting for future land rights cases and the land claims process. The court confirmed that aboriginal title entails rights to the land itself, not just the right to extract resources from it. The court also ruled that the government has a duty to consult with First Nations on issues concerning Crown land and in some instances may have to compensate them for infringing on their rights to that land. The case was launched by Chief Earl Muldoe, known as Delgamuukw, and other hereditary chiefs of the Gitxsan and Wet'suwet'en First Nations in B.C., who took the provincial government to court in an effort to establish ownership and jurisdiction over 58,000 square kilometres of territory in the Skeena watershed in northwestern B.C. The Supreme Court did not rule on the question of ownership, saying the issue had to be decided at a new trial, but gave a detailed interpretation of what constitutes aboriginal title, laying out guidelines for how the issue should be approached in future disputes. 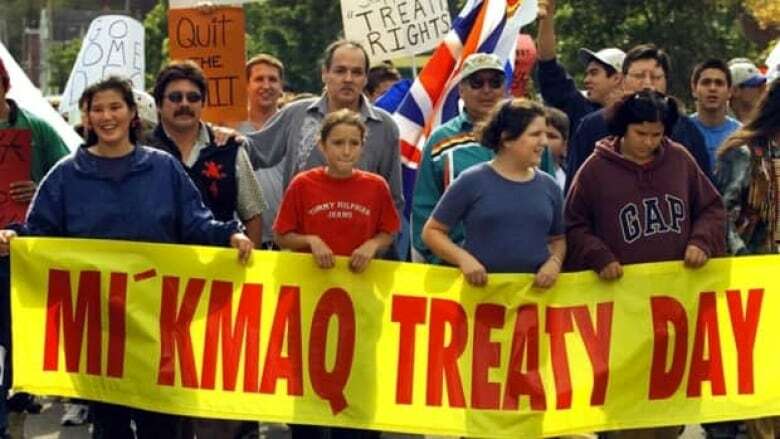 R. v. Marshall (1999) — This court battle over fishing rights in Nova Scotia inflamed tensions between aboriginal and non-native fishermen in the Maritimes and Quebec. Donald Marshall Jr., a Mi'kmaq man from Nova Scotia who decades earlier had been wrongfully convicted — and ultimately acquitted — in a high-profile murder case, had been charged with fishing eels out of season, fishing without a licence and fishing with an illegal net but argued that aboriginal rights stemming from 18th-century treaties with the British Crown exempted him from fisheries regulations. After the Supreme Court ruled in his favour, upholding the Mi'kmaq and Maliseet people's rights to earn a "moderate livelihood" from commercial fishing and hunting, native lobster fishermen interpreted the ruling as granting them rights to catch lobster out of season and clashed with their non-native counterparts, who feared lobster stocks would be jeopardized. After a particularly heated showdown in Burnt Church, N.B., the court was forced to issue a clarification of its ruling, which underlined that the ruling applied to fisheries only and not to all natural resources and that the government could restrict aboriginal fishing rights in the interests of conservation. The ruling was considered a key test of native fishing rights and sparked debate over what should and shouldn't be considered "traditional' use of natural resources. Corbiere v. Canada (1999) — John Corbiere and other members of the Batchewana band near Sault St. Marie, Ont., took their band and the federal Ministry of Indian and Northern Affairs to court challenging the Indian Act provision that denied band members who lived off reserve the right to vote in band elections. They argued that Sec. 77(1) of the Act violated the equality provision of the Charter of Rights and Freedoms. The Supreme Court of Canada agreed, declaring the part of the Act that required electors to be band members "ordinarily resident on the reserve" unconstitutional. The decision led to the changing of the Act, which now defines an elector as someone who is at least 18 and a registered member of the band, and impacted the way some bands formulated their own rules governing membership. McIvor v. Canada (2009) — This B.C. Court of Appeal decision forced the federal government to amend the Indian Act to eliminate discrimination against the wives and children of non-status Indians. The case was launched by Sharon McIvor, a B.C. aboriginal woman who had married a non-status Indian, and her son, who was married to a non-Indian and could not legally pass on Indian status to his children. McIvor and her son, Charles Grismer, launched a Charter challenge alleging that Sec. 6 of the Indian Act violated the right to gender equality under Sect. 15 of the Charter of Rights and Freedoms. Prior to 1985, aboriginal women who married a non-status Indian lost their status while men who married a non-status woman remained status Indians and could confer this status onto their wives and children. The court found that an 1985 amendment to the Indian Act eliminated this provision but left in place provisions that still discriminated against some children of non-status Indians by conferring status to those whose Indian grandparent was a man but not to those whose Indian grandparent was a woman. The appeal court ruled in the plaintiffs' favour and ordered the government to amend the legislation within a year.